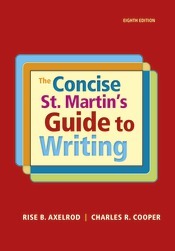 The new Concise St. Martin’s Guide to Writing provides streamlined coverage of the six most commonly assigned genres in first-year composition, including remembering events, writing profiles, explaining concepts, arguing a position, proposing a solution, and justifying an evaluation. The Concise Guide leads students through the writing process: Guides to Reading equip students to analyze a genre’s basic features, and Axelrod and Cooper’s distinctive Guides to Writing help students apply their analysis of reading to the development of their own writing projects. With a new introductory chapter (“Composing Literacy”) on writing a literacy narrative, a new assignment chapter on analyzing and synthesizing opposing arguments, and a new chapter on analyzing and composing multimodal texts, the Concise Guide helps students accomplish their writing goals from start to finish. The eighth edition is now available with LaunchPad for The Concise St. Martin’s Guide to Writing, an online course space of pre-built units featuring the full e-book, reading comprehension quizzes, tutorials, and adaptive LearningCurve activities to help students hone their understanding of reading and writing.